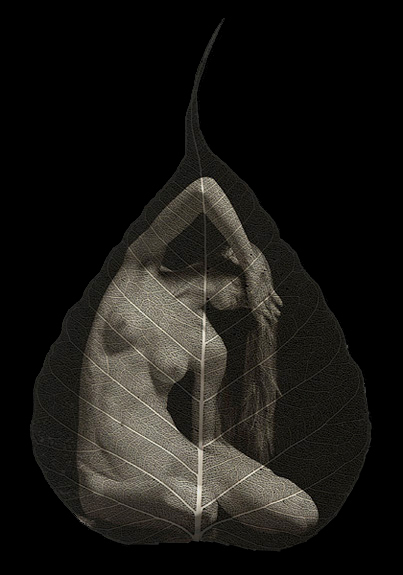 Ted Preuss - Blog: Platinum Printing on Skeleton Leaves! Platinum Printing on Skeleton Leaves! Last week I successfully printed new images onto skeleton leaves. 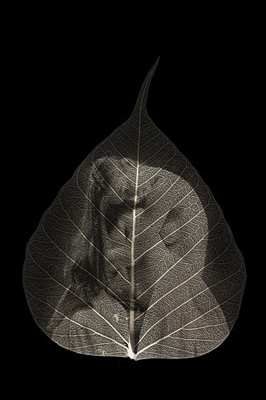 The process is similar to my platinum palladium prints, but instead of hand-coating rag paper I coat skeleton leaves. The success rate is around 20% because of the fragility of the leaf when wet and its pH balance for my platinum mixture. But when it all works they are just incredible. Under a microscope the image actually wraps around the veins of the leaf. The leaf I chose is from a Bodhi or Peepul tree, which is a species of fig and a sacred tree for Buddhists. The most famous Bodhi tree is located about 100 km (60 miles) from Patna in the Indian state of Bihar, under which Gautama Buddha, spiritual teacher and founder of Buddhism, arrived at Bodhi (lit. (supreme) knowledge, enlightenment). I'm glad you had some succes on printing with more leaves. They are stunning to see. Very interesting. How fragile are the leaves after imprinting? BTE: I grew up & spent the first 16 years of my life in Patna.